A Narrow Escape A desperate warning saved lives as a munitions factory exploded. A Cosmic Warning A Bible warning about misguided hopes and false beliefs. The First Angel Proclaims The whole message of the first angel. The Everlasting Gospel God's love for mankind let Christ to the cross. Joyful Reverence A message to arouse God's people from backsliding and worldliness. Living for Jesus God's law is established in the hearts of the reconciled. Time for Judgment An ancient ritual sheds light on activity in heaven. Honor the Creator The fourth commandment specifies honor to the only Creator God. The Second Angel Proclaims The whole message of the second angel. Babylon Is Fallen Departure from Bible teachings has led to the spiritual fall of religious institutions. The Third Angel Proclaims The whole message of the third angel. Satan's Mark vs. God's Seal Both Satan and God have established loyalty behaviors. Let Freedom Ring Freedom to believe without coercion -- a fundamental human right. Enforcers of the Mark Prophecied powers will bring religious persecution. The Final Conflict Begins The impending final conflict between truth and error. God's Final Warning Message "Fall of Babylon" message given by a fourth angel. Reluctant Retribution Punishing plagues will fall on the enemies of God's people. Deliverance The second coming of Jesus will deliver His persecuted people. The Reward of the Wicked God will destroy the rejectors of God's grace with a consuming fire. Home at Last There is no night in the city of God, only light and happiness. 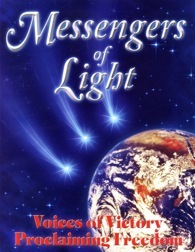 Note: The "Messengers of Light" magazine in printed form is 32 pages, approx. 8" x 10.7". The text of this magazine was selected from the writings of E.G. White. Compiled and edited by Brian Jones.